BSG study uncovers factors creating a divide between consumers and QSR industry. Despite the convenience of fast food, Americans are eating more home-cooked meals than restaurant meals in a bid to take control over their health, according to the 2017 Food Attitudes and Behaviors Study by Benenson Strategy Group (BSG). The trend study also found growing concerns around sugar and pesticides, as well as changing preferences that are putting the pinch on quick-service restaurants (QSRs). Consumers overwhelmingly favor the foods they prepare to the ones they buy, with 77% indicating they always prefer a home-cooked meal to a restaurant meal. What’s more, about twice as many eat home-cooked than QSR meals on a weekly basis. This even holds true for lunch, a meal when workers tend to eat on the go – 82% eat a home-cooked lunch at least weekly, while just 44% eat at a QSR, 32% at a full-service restaurant and 31% grab pre-made food from a grocery store. [Chart 1]. 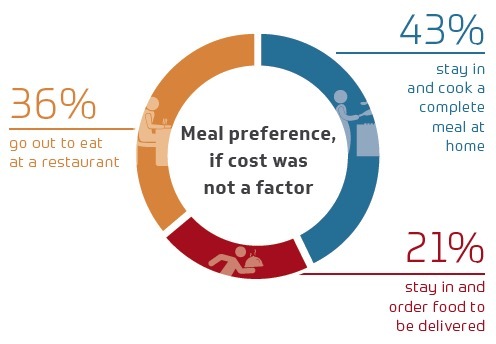 While most would prefer to eat at home rather than go out, surprisingly cost isn’t the main deciding factor. BSG found, price aside, 43% would stay in and cook, 36% would order delivery and just 21% would go to a restaurant. [Chart 2]. Kids are embracing the role of chef, frequently cooking with and for their families and perpetuating the trend of at-home cooking. 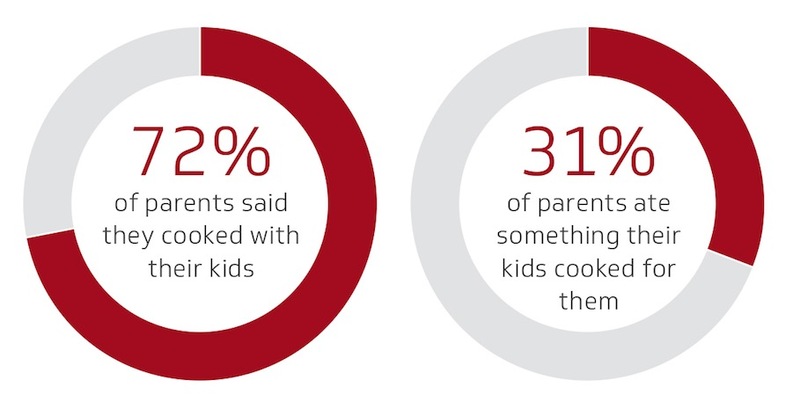 In any given week, 72% of parents said they cooked with their kids and 31% ate something their kids cooked for them. [Chart 3]. Additionally, nearly half – 43% – ate dinner at home with their families at least five times. A desire for unmodified and “free-from” foods is also leading many to cook for themselves. The study reveals that pesticide-free, antibiotic-free, hormone-free and sugar-free ranked high on the list of important food attributes. [Chart 4]. These preferences are reflected in the types of diets that people want to try – Mediterranean was first, high-protein was second, and low-sugar and Paleo tied for third. [Chart 5]. QSRs are taking a hit as a result of this health-centric movement, with flat growth and, perhaps worse, a mounting stigma. BSG found 38% of all consumers would be embarrassed to be seen eating too much at a fast-food chain. The numbers were highest among millennials – 50% said they’d be embarrassed, up from 44% over last year. [Chart 6]. 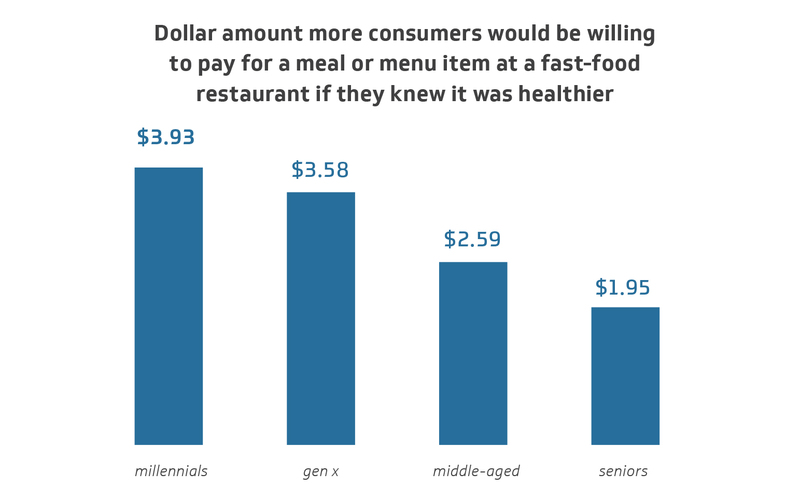 Americans want healthful fast food and are willing to pay for it. On average, consumers said they’d spend an extra $3 for fast-food items that are healthier than the originals. Millennials are willing to spend close to $4 extra, while seniors are only willing to spend around $2. [Chart 7]. BSG looked at how major QSR chains ranked in areas of growing importance to diners, such as trust and caring about issues other than profits. Subway ranked as the most trusted of the QSRs studied, with 60% of consumers indicating they trust the brand, while Chick-fil-A ranked second with 59%, and Wendy’s was third with 55%. 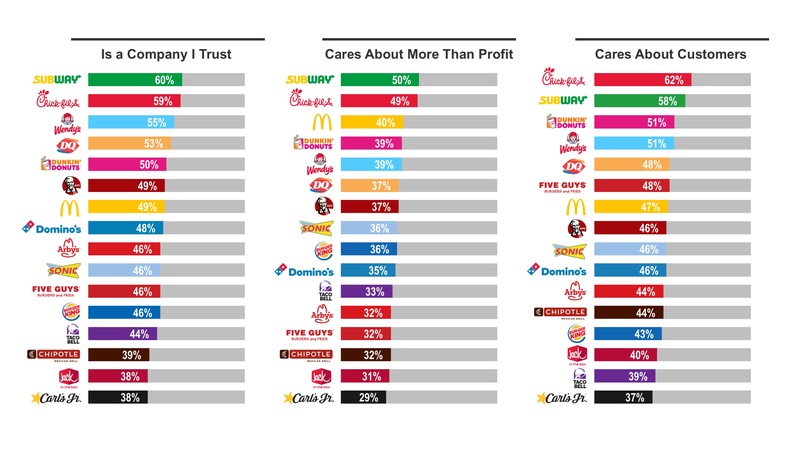 Subway, Chick-fil-A and McDonald’s were the top-three ranked in terms of “caring about more than profit,” and Chick-fil-A, Subway and Dunkin Donuts ranked highest for “caring about customers.” [Chart 8]. A brand’s values can also considerably sway consumers, and even lead them to boycott. 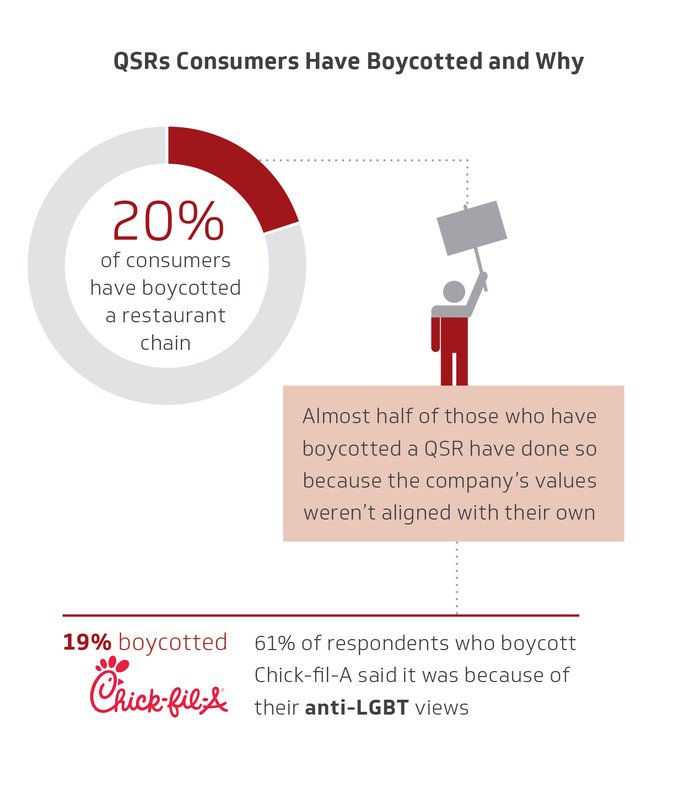 In fact, 20% report boycotting a restaurant chain (Chick-fil-A was the most boycotted), and in nearly half of those instances, it was because they felt a brand’s values were not aligned with their own. [Chart 9]. 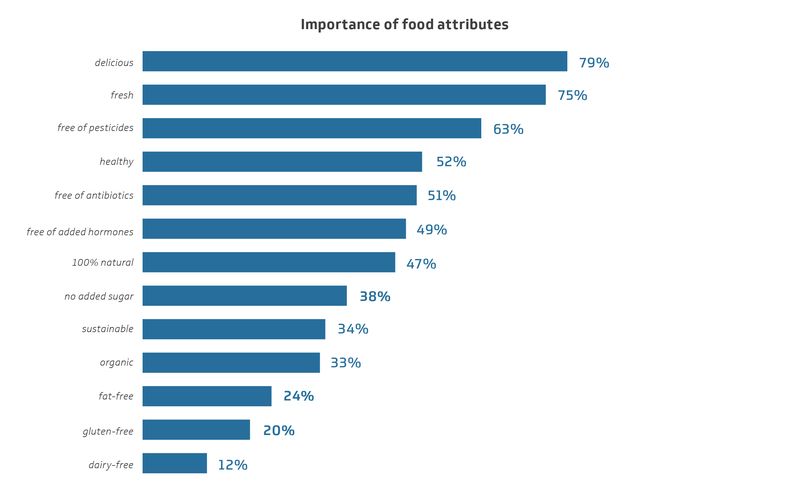 The 2017 Food Attitudes and Behaviors Study was conducted in May 2017. BSG surveyed 1,500 consumers ages 18 and older nationwide to understand their attitudes, habits and values surrounding food. The random sample of 1,500 has a worst-case 95% confidence interval of ±2.5% about any one reported percentage.